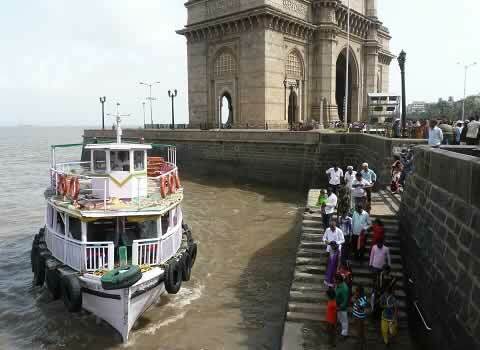 In the Monsoon season (early June to early Sept) there is NO BOAT SERVICE from Gateway of India to Alibag (Mandwa). The cost of the Gateway of India to Alibaug ticket includes both the boat trip and the bus journey. 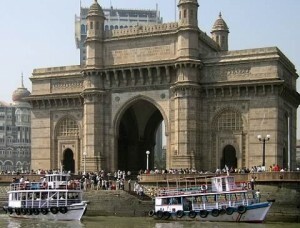 In Mumbai the boat journey starts and ends at Gateway of India, near Regal, Colaba. At Mandwa the boat trip starts/ends at the Mandwa Jetty and in Alibaug the bus ride starts and ends at the Alibaug Bus Station/Stop. Alibaug is also written and pronounced as “Alibag” and “Alibagh”. All ticket prices are in Indian Rupees. This is the cost of an one-way ticket from Mumbai to Alibagh. Ticket price includes both, the cost of the boat trip and the bus trip from Mandwa to Alibaug or Alibaugh to Mandwa. Listed below is the timetable and start time of boats from Gateway of India (Mumbai) to Alibaug (via Mandwa). Also listed are the bus timing from Alibaug Bus Stop to Mandwa Jetty and the ferry boat timing from Mandwa to Mumbai (Gateway Of India). At Gateway of India (Mumbai), the Mumbai to Alibag boat ticket counter is at the entrance of the Gateway of India Complex (Please see the below image). 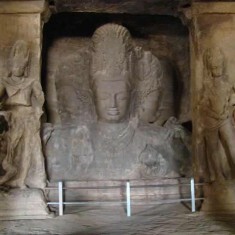 Ferry tickets to Elephanta Caves are also available from here. Boats are available from a landing spot near the Gateway of India monument. At Mandwa, the boat ferry trip starts/ends at the jetty. The Mandwa to Alibaug Bus is available from near the jetty. At Alibag, the ferry bus starts/ends at the main Alibaug Bus Stop in town. 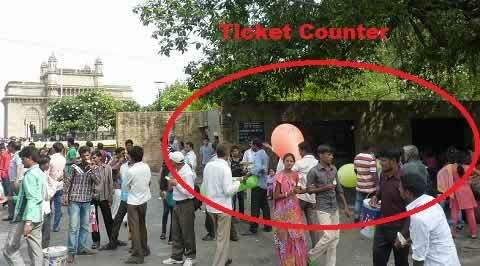 Tickets can been booked from a counter near the bus stop. There are companies, such as Apollo Cruise Events, West Coast Marine Yacht Services, etc that rent out boats (yachts, catamarans, etc) for private charter and parties.